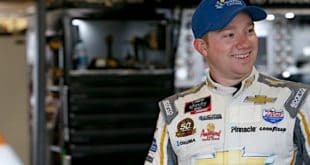 Sprint Cup Pace Laps: Raining On NASCAR’s Parade… But Not Kurt’s —You’ve got to feel for NASCAR, who was damned if they did and damned if they didn’t Sunday at Michigan. With a forecast that called for “popup showers” it was silly to postpone the Sprint Cup race until Monday; the easy decision was to dry the track. However, going green again after the first rain delay caused hours of agony, multiple stoppages for downpours and the eventual end of the race 62 laps short of its scheduled distance. It reminded many of a regular season, rained-on baseball game full of stops and starts; the difference is, with just 36 races every event NASCAR runs carries that much more importance. What resulted seemed like a waste, an ending jumbled so much by rain and a Kevin Harvick caution during green-flag stops the whole day felt… random. It was if each driver had no control over their destiny, picking a finish out of a hat instead of doing their racing on the racetrack. The only thing that seemed right, in this type of scenario was Kurt Busch coming out the winner, a way for the racing Gods to “balance luck out.” Remember, a series of questionable Fontana cautions cost Busch a win earlier this year. The No. 41 team, which dominated that race had a right to throw their hands in the air in disgust, a victory tilting Brad Keselowski’s way on a green-white-checkered finish. NHRA: Experience Trumps Youth – The three NHRA Mello Yello Series winners at this weekend’s NHRA New England Nationals at New England Dragway have 28 world championships between them so experience was definitely the name of the game. Tony Schumacher (8-time champion), John Force (16-time champion), and Greg Anderson (4-time champion) took home the wins for Top Fuel, Funny Car, and Pro Stock respectively. For Schumacher and the U.S. Army team, the victory was particularly sweet. What was the 79th career victory for “the Sarge” was also a nice present for to help celebrate the 240th birthday of the U.S. Army. Schumacher also defeated Morgan Lucas, Clay Millican, and Spencer Massey on his way to a final round matchup with 3-time series champion Larry Dixon. Schumacher earned the Wally with a run of 3.809 seconds at 320.74 mph to Dixon’s 3.881 seconds, 319.60 mph. John Force scored victory number 143 for his career and second for this season with a 4.160 second, 309.49 mph pass against weekend No. 1 qualifier Tommy Johnson, Jr. The victory also means Force now has a win at every track that has appeared on the NHRA Mello Yello Drag Racing Series circuit. “I raced here 38 or 40 years ago before most of you were born to come back and have one race on the circuit that I couldn’t win; I needed this race win. One of these days I am going to go out and it is going to break my heart but I ain’t leaving until I win all of them and now I’ll try and win all of them twice. This was a great day,” said Force. Force also defeated Dave Richards, Matt Hagan, and Cruz Pedregon en route to his matchup with Johnson, Jr.
Greg Anderson finally hit a long awaited milestone with his 75th career victory at the Gatornationals earlier this season, but now that he passed that elusive number, he’s on a bit of a hot streak, posting career win number 77 at Epping, the first time since 2011 that he’s posted back-to-back wins after also scoring the victory last weekend at Englishtown. Anderson ran past Val Smeland, Drew Skillman, and teammate Jason Line before matching up against Allen Johnson in the finals, a rematch of last week’s final round matchup at Englishtown. Anderson was once again the victor, posting a run of 6.512 seconds at 214.72 mph to Johnson’s 6.530 at 213.50 mph. 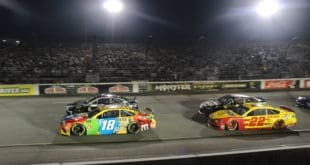 XFINITY: Fast and Furious for Kyle Busch at Michigan – Finally making his return to the XFINITY Series, Kyle Busch was back with a demeanor that we haven’t seen from him in quite a while. Though he didn’t have the best car at the two-mile oval on Saturday, the division’s all-time wins leader surely made sure that he was in Victory Lane when it was all said and done. Passing reigning champion Chase Elliott with four laps left in the race, Busch held on to bring the No. 54 team its first win of the season. 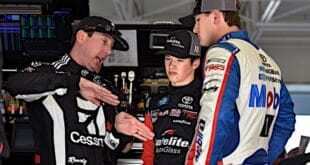 Crew chief Chris Gayle had never won on a non-plate track until Busch’s return at Michigan, and it should be a cause for concern among the competitors since the two are going to get even better as the season rolls on. IndyCar: CFH Racing Goes from the Bottom to the Top – Carpenter-Fisher-Hartman Racing scored the first 1-2 finish in company history on Sunday’s Honda Indy Toronto, fending off Team Penske’s Helio Castroneves and Will Power. If you ask any member of the team, they’ll tell you it couldn’t have come at a better time. Once a dark horse in the championship battle, Josef Newgarden had suffered back-to-back 21st-place finishes in the second Detroit GP and the Firestone 600 and had taken the position of outlier. The No. 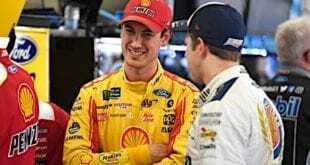 20 car hadn’t done much better, brining home finishes of 17th in Detroit and 20th – which caused a double DNF for the team – in Texas with Luca Filippi and Carpenter, respectively. Outside of Newgarden’s victory in the Honda Indy Grand Prix of Alabama, neither he nor Filippi had a top-five on the year. However, a timely caution just after Newgarden pitted on lap 28 and bold driving from Filippi set the two stars up for a thrilling battle for the victory in Toronto. Camping World Truck Series: Johnny Sauter’s Pit Road Struggles – Johnny Sauter hasn’t exactly been setting the Truck Series world afire with his performance right now, but Saturday night at Gateway Motorsports Park, his pit crew made it even harder to find success. Each time the veteran brought his No. 98 Toyota down pit road for service, the stop was so long that it cost Sauter several positions, leaving him to make up the time on track. Not normally one to shy away from his emotions, even in the heat of the moment, Sauter called his crew’s performance “pathetic” following a third-place finish.